Recently wonderful event HAPPENED, “Vizhiyavom Vazhiyavom”. The event started at 10.30am at Dr.MGR Home & Higher Secondary School for the Speech and Hearing Impaired at Ramapuram, MGR Gardens, Chennai. The Event commenced by welcoming chief guests: Dr. V.Sivaraman,Associate Professor of English, Presidency College, Chennai and Mrs. P.Arunadevi Revenue Assistant and Trusser of SFRAWD. This event was to appreciate all the volunteers for being with us, and actively taking part in our different activities like Scribing, Recording and Reading Sessions for visually challenged friends. Also to launch a Braille book first time on Abdul Kalam, named “Kalam – Naam Ariya Pakkangal” for visually impaired friends. Nearly 70 Volunteers attended the event. 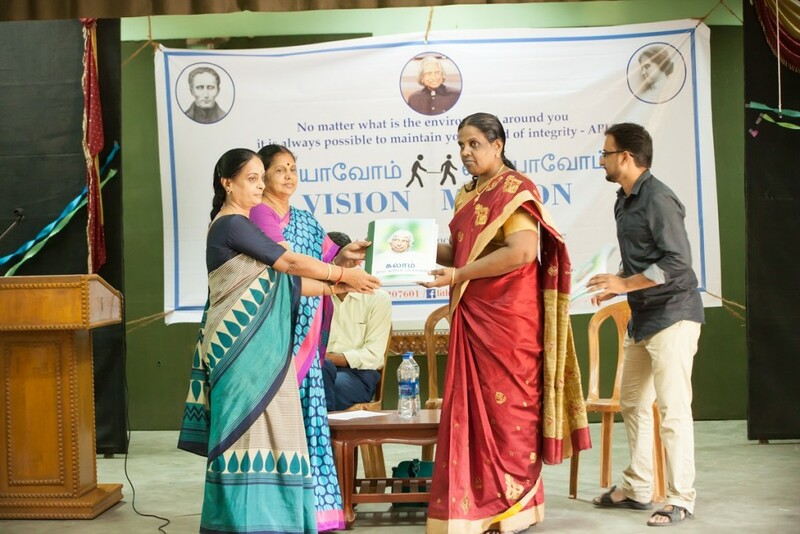 All the volunteers of “LIT The Light” were felicitated with the certificates for their contribution as a Scribe or Reader for our visually impaired friends. Our guests of honour lauched the book “Kalam – Naam Ariya Pakkangal” and Mrs. P.Arunadevi handed over the first book to our senior volunteers who are serving for more than 5 years as a scribe to many visually challenged students. 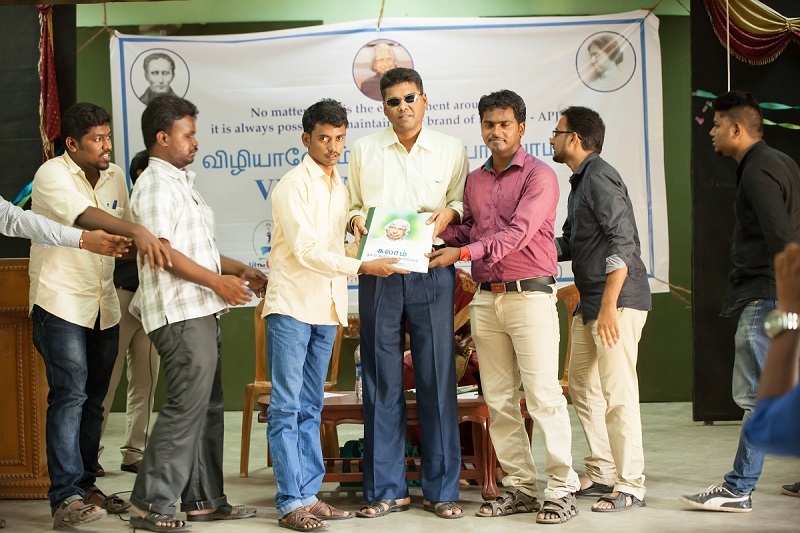 Next Dr. V.Sivaraman handed over few copies to our Visually Impaired students. This Book is going to inspire them and make them confident enough to face the different challenges in Life. 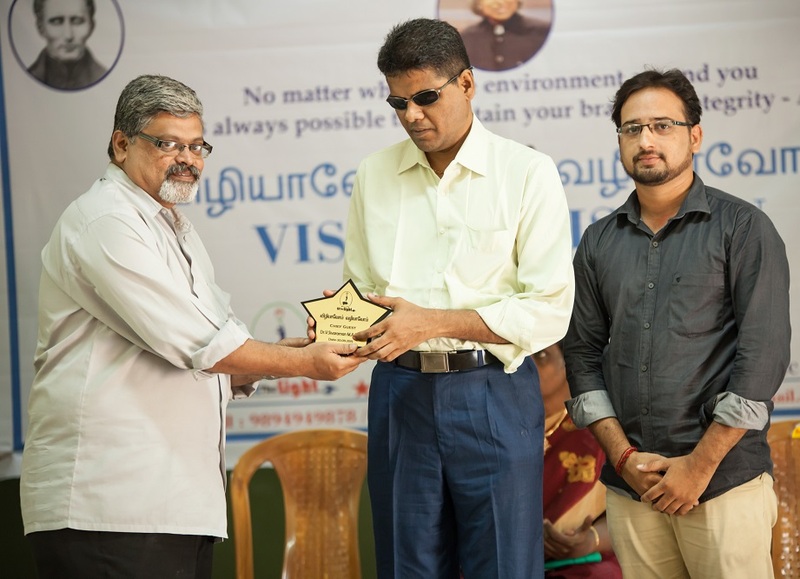 Dr. V.Sivaraman thanked LTL team for their continuous support and said that “Give a man a fish and you feed him for a day; teach a man to fish and you feed him for a lifetime”. He also said that the world should not feel pity on them and help but help them to stand on their feet, help them to Change their Future. Mrs. P.Arunadevi shared few guidelines necessary for each volunteer coming as scribe, she said that the scribes should reach on time, scribes own the future of VI students so they should be serious enough in their activity or else it will indirectly affect the future of the VI students. Also said these scribes not only write the exam for VI students, they change their entire life style. Valuable suggestions and guidelines where shared regarding the Scribing activities and Reading session for visually impaired people. They also shared do’s and don’ts to be followed by the Scribes and the VC students. The guidelines will be very helpful for all our volunteers in mere coming future. Few of VC students shared their thoughts and in what way exactly we can help them. One of the VC student who is lawyer expects LTL to be a well formed organisation in mere coming future especially for scribing with complete reliability. Then all taken the 10 points pledge (Oath for students) of Dr. APJ Abdul Kalam. Finally the event ended with National Anthem. Few volunteers from different NGO’s also attended this event. We had a good sharing of different Ideas which can be implemented for the benefit of VI people. “Lit the Light” takes this opportunity to thank all the volunteers, supporters from different NGO’s who helped us Directly or Indirectly to make this Event a grand Success. LIT THE LIGHT exist only with the untiring support of it’s volunteers.